Archer fish knock their insect prey out of overhanging vegetation with a jet of water several times more powerful than the fish’s muscles. New research now shows that the fish generate this power externally using water dynamics rather than with any specialized internal organs. 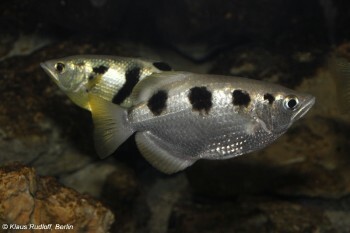 The research, published 24th October in the open access journal PLOS ONE by Alberto Vailati and colleagues from the University of Milan, provides the first explanation for how archer fish can generate such powerful jets to capture their prey. Archer fish inhabit mangrove swamps and estuaries where insects are abundant above water, and they’ve evolved an impressive strategy for catching them. Their ‘spitting’ technique can target and dislodge single insects, which in some cases hang on with a force of 10 times their own body weight or more. The species under study, Toxotes jaculatrix (Pallas, 1767), is well-known and a popular aquarium fish, especially in public displays, yet the mechanism driving its ability to shoot accurate, powerful jets of water in less than a second has remained a mystery until now. Other animals like chameleons and salamanders store energy in collagen fibers in their bodies and release it rapidly to project their tongues at high speeds, but previous studies on archer fish have ruled out such specialised organs as the source of their weaponry. The scientists used high-speed video recordings of archer fish blasting insects out of overhanging plants to study the mechanics of the water jet and found that the fish could modulate the velocity of the jet to create a single large water drop that hit the prey with a large force. They conclude that this approach avoids the evolutionary costs needed to develop special internal structures to store these large amounts of energy. “The origin of the effectiveness of the jet squirted by archer fish has been searched for inside of the fish for nearly 250 years. The striking finding of our work is that a large amplification of muscular power occurs outside of the fish and leads to a very powerful impact of the jet with the prey” says Vailati.